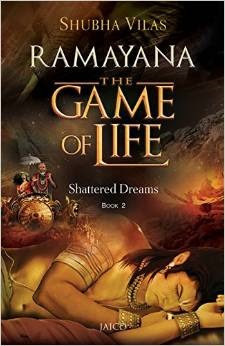 Second of the 6 book series "Ramayana: The Game of Life" is "Shattered Dreams". A tale retold by Shubha Vilas following closely Valmiki's and Kamba's Ramayana for modern audiences. In the first book the author covered the period of Rama's life in sync with the twelve beautiful years in Ayodhya's life. While this one is more about Rama's strong will, Sita's calmness, patience & resilience and Lakshmana's selfless services towards his elder brother. The book definitely covers the exile. The drama and the action is impeccable. It has adventure, love, care, deceit, heart breaking conspiracies, hatred but also a teaching of selflessness for a greater good. It illustrates how one can be misunderstood easily and anger is no good but when you have someone who loves you unconditionally and have faith in you, well, then you can conquer anything in life. This book is in short an interesting ride. All the characters play key role. Although we have lot more characters in this book than in its predecessor, its never hard to keep up, in fact while reading you feel like one of them. It gives an idea about a period we are now living in and the people with so many contradictions with regards to their character and action. The author presents the very truth of life in a simple yet interesting way. Like its predecessor its gripping too with simple use of words, rich literature and beautiful cover illustration, but more interesting. Not one moment when I was bored. I recommend it too all mythology and to non mythology lovers too. Book- Ramayana: The Game of Life "Shattered Dreams"
For the review of the first book of the series - Rise of the Sun Prince, click here.